CLEVELAND, Ohio -- Cleveland's Global Center for Health Innovation may be months away from opening to the public, but one marquee tenant -- the industry leader in healthcare information technology -- has completed its space on the top floor and is welcoming an in-the-know crowd. That includes members of the Cleveland Big Data and Hadoop User Group, about 200 of whom found their way to the white box aside the new Cleveland Convention Center Monday night. The Healthcare Information and Management Systems Society -- or HIMMS -- spent some $2 million outfitting the entire fourth floor of the Global Center into an exhibition and product-testing center. The bright lights and colors, multi-media kiosks and touchscreens the size of big screen TVs impressed a crowd accustomed to state-of-the-art technology. 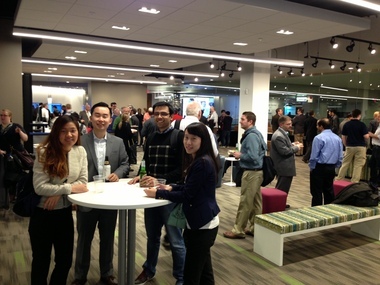 So did the full bar and the presentations by industry experts, which commenced after happy hour. "When I walked in I was like, 'This is so cool,' said Doug Meil, a software engineer and president of the Cleveland Hadoop User Group, or CHUG. Hadoop is a widely used, open source framework for large-scale data processing. The local user group was founded by Meil and others working with big data at companies like Explorys, Progressive Insurance and the Cleveland Federal Reserve Bank. Monday's meetup attracted a larger than usual crowd and Meil knows why. "It's nerds on the loose," he said. "Everyone wanted to see this building. Hadoop is all about IT innovation and doing neat things with data. This place, the theme fits us perfectly." HIMMS executives hope other IT specialist in the area feel the same way, especially those working in healthcare. Representing 52,000 IT executives, Chicago-based HIMSS (pronounced like church "hymns") is one of the largest medical organizations in the world. It's best known for its Interoperability Showcase™, a feature of its annual convention, which allows hospitals and healthcare institutions to test new products and technologies to insure the equipment is compatible with their current networks. HIMMS had been looking for a permanent location for its plug-and-play showcase. When it chose Cleveland last February, leaders of the Global Center knew they had an anchor tenant that could attract wide attention. John Paganini, a Cleveland data specialist recently appointed senior manager for interoperability initiatives at HIMMS Cleveland, said he expects companies large and small to make Cleveland their medical product testing center -- once the Global Center is fully open. Meantime, he's leading tours and hosting special events with kindred spirits, sharing his vision for a one-of-a-kind place. "Cleveland is hopefully destined to become the healthcare mecca of the universe," he told CHUG members. "The future looks very interesting."